Judith Viorst and Ray Cruz, New York: Scholastic, Inc, ISBN 0-590-42144-1, £3.99, 1972, 30pp. But what’s so fab about a grumpy kid stomping around being grumpy about what a bad day it is? So much. From the first page, Viorst and Cruz portray their protagonist with sympathy and compassion: Who hasn’t gotten gum in their hair? Who hasn’t dropped a piece of clothing into the wet sink? Alexander’s voice rings through so clearly in the cadence and diction of the text while his face on each double-page spread fill in the gaps for his day’s roller coaster of emotions. He also firmly believes that all of his problems will be solved if he just moved to Australia. While the cover is drawn in full primary colours, the illustrations are pen-line drawings in black and white. Recent years have seen an upsurge in black and white picture books (see Ian Falconer’s Olivia series to see this done masterfully; or take Liz Thiel’s Visual Text MA seminar at Roehampton for a fantastic sampling! ), the drawings aren’t rendered in black and white to provide high contrast visually. Rather, I believe, Cruz’s drawings simply provide a grey, bleak background for Alexander’s lists and lists of complaints and grievances. What is most charming about this picture book is how easy it is to relate to Alexander’s character. There are now picture books which address a wider range of the emotions that children do indeed feel and are able to explore in books generally – anger, grief, depression, sadness, worry, on and on – and yet I have not found a picture book that better deals with the issue of ‘that’s-just-how-life-is-sometimes.’ The story is able to deliver this sense of relief: at the end of it all, Alexander’s mom assures him ‘Some days are like that…. Even in Australia’ (np). 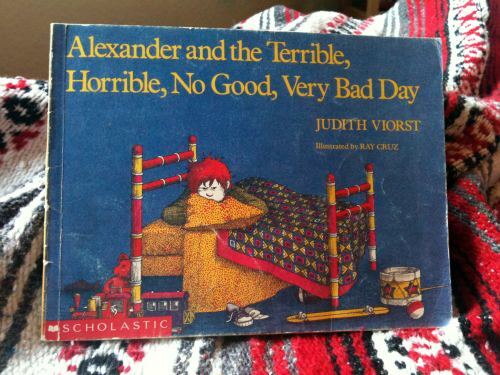 This simple message provided the knowing (as a child then and an adult now) that I am, really, just a human being who has crappy days sometimes – and, probably, not all days will be like Alexander’s. But even if they are, that’s OK, too. « And all that Jazz ….